The triceps are three-part muscles on the back of the upper arms. They consist of the long, medial and lateral heads, which get worked when you straighten or extend your arm. An Olympic triceps bar is rectangular in shape and it has two parallel handles in the center for gripping. Not only can this tool work the triceps, but it can also target other parts of your upper body. The lying triceps extension is also known as a skullcrusher. This exercise is commonly done with an EZ curl bar, which has a wavy handle. When using the Olympic bar, your palms face each other, which places the emphasis on your triceps. Begin by lying face-up on a flat weight bench, holding the bar directly above your chest with your arms fully extended. Keeping your upper arms still, bend your elbows, and lower the bar to within an inch of your forehead. Push the bar back up in a steady motion and repeat. An overhead triceps extension is performed from a standing or seated position. Grasp the handles of the bar, and hold it straight above your head with your arms fully extended. Keeping your back straight and core tight, lower the bar behind your head by bending your elbows. Steadily push the bar back up and repeat. When doing this exercise, make sure to keep your elbows as close to your ears as possible. Hammer curls work the biceps, which are on the front of the upper arms. These are known as opposing muscles to the triceps. This exercise gets its name from the position of your hands. You hold the handles of the tricep bar the same way you would hold hammer handles. When using dumbbells for this exercise, your palms face each other throughout. To begin, stand with your feet about shoulder-width apart, and hold the bar in front of your thighs. Keeping your back straight and core tight, bend your elbows to lift the bar up toward your chest. 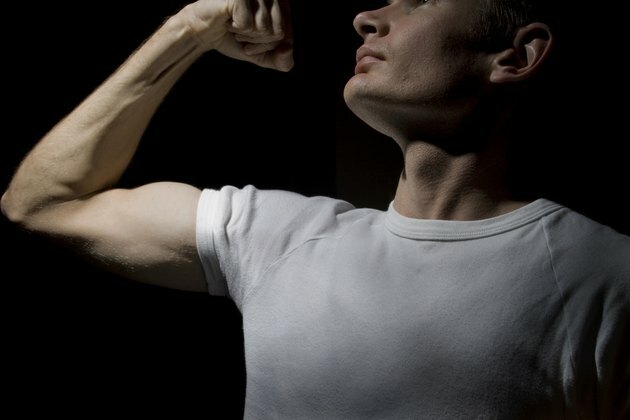 Squeeze your biceps forcefully for a full second, slowly lower the bar back down and repeat. Make sure to keep your upper arms tight to your sides throughout this exercise, and do not swing your hips forward for momentum. Front raises work the anterior deltoids on the front of the shoulders. These are commonly done with dumbbells. Using the Olympic bar places the emphasis on your forearm muscles. To begin, stand with your feet about shoulder-width apart, and hold the bar in front of your thighs. Keeping your core tight and back straight, raise the bar in front of your body until it is at chest height. Keep your arms as straight as possible when you do this. Slowly lower the bar back to the front of your thighs and repeat. The triceps bar weighs about 20 pounds on its own. To increase the resistance, slide weight plates onto the ends, and anchor them with collars. Weight plates range from 2.5 to 45 pounds. What Exercise Machine Works the Triceps?